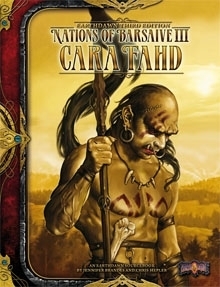 Nations of Barsaive Volume Three offers Earthdawn gamemasters and players an in-depth look at the newly reborn Ork Nation of Cara Fahd, forged only shortly after the Therans’ return to Barsaive. From the Twilight Peaks in the North to the forests of Landis in the South, Cara Fahd is home to Barsaive’s mightiest ork tribes. This book features revised and updated content, and new material for adventures in the world of Earthdawn. Requires use of the Earthdawn Player’s and Gamemaster’s Guides.